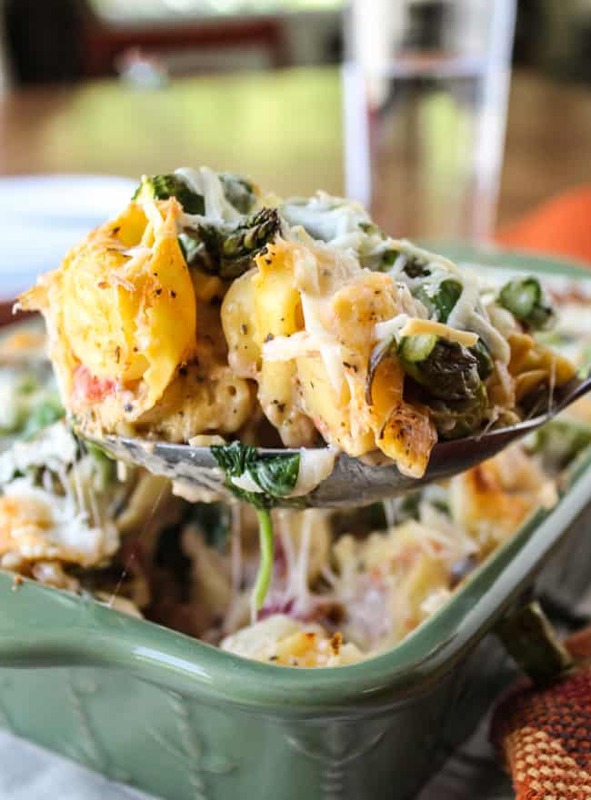 This is a hearty no-brainer dinner to make on busy back-to-school nights. 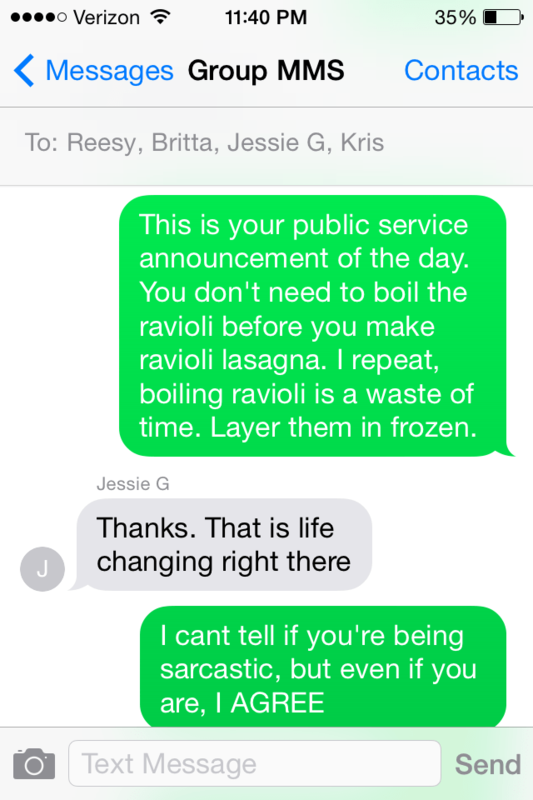 You don’t even have to cook the ravioli, just throw it in frozen. It’s a total crowd-pleaser! And a great make-ahead meal too. Today I went to Charlotte’s preschool registration. The teacher had emailed us requesting that we bring 2 photos of Charlotte, I assume to put up on the wall in their classroom. MEATBALLS. Raw meatballs. Eric apparently thought that this picture had a lot more character than the professional ones. Well it certainly does, along with a blurry face and a hairdo that makes Charlotte looks like a street urchin. Oh, and don’t worry that half the photo is RAW MEATBALLS. 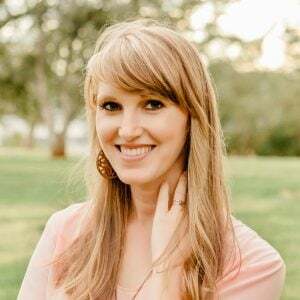 Handing this picture to the teacher is like handing them a guarantee that this one will be The Problem Child, because their parents are freaky weird. Also, her first nickname will be Meatball Girl. Every preschooler’s dream. Well even if Charlotte’s earliest school years are now haunted with meatball memories, at least she will get this for dinner. It’s not so bad having freaky weird parents when you get Ravioli Lasagna. Kind of rounds things out. 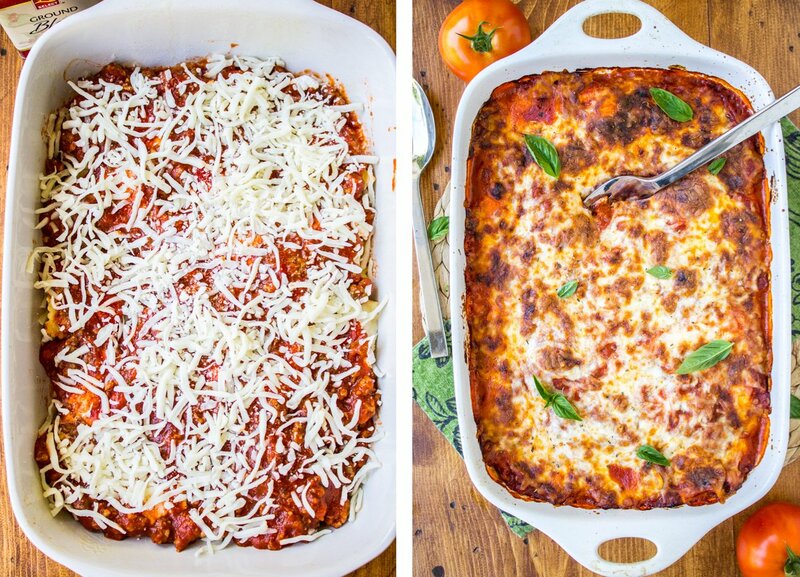 You can make this lasagna as easy or extensive as you want it to be. You can add sausage to the sauce, or leave it out. You can layer sliced zucchini or other squash, if you have it around. You can jazz up the ricotta with an egg or spices. Pretty much any way you make it, it’s going to be amazing! Love no-fail recipes like this. 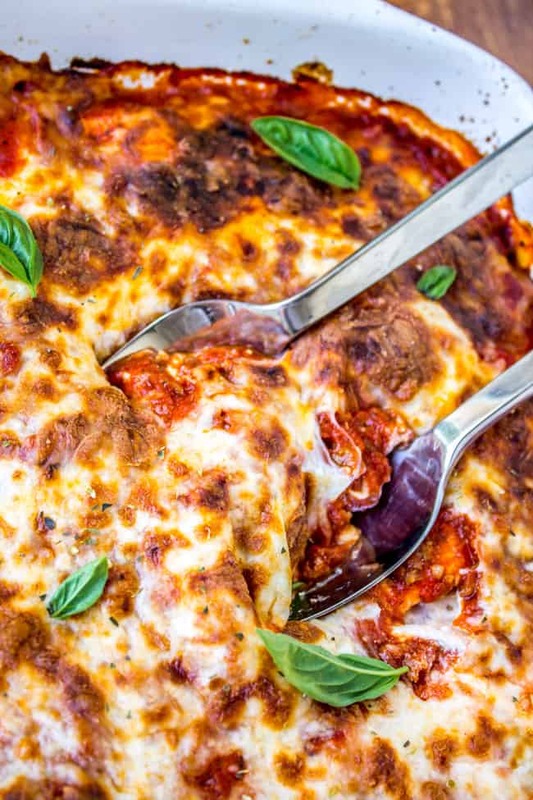 You will love these other great back-to-school dinners! 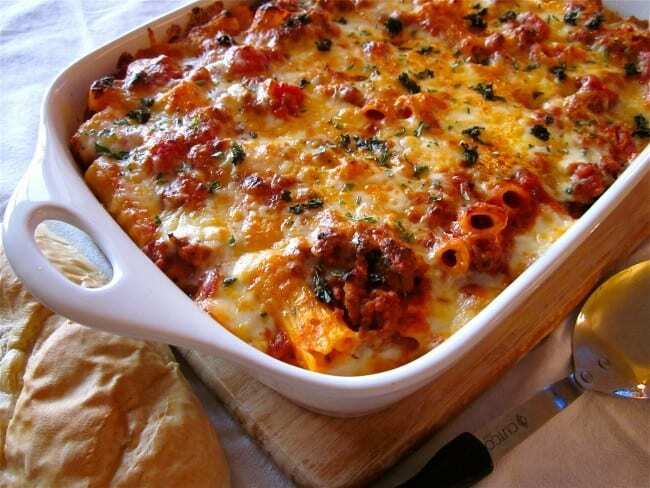 This Baked Ziti is one of my favorite casseroles of all time! 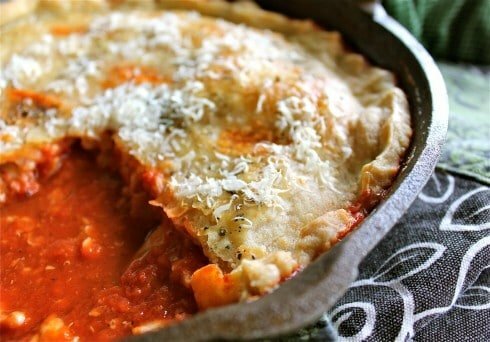 Here’s another quick dinner–Chicken Parmesan Pot Pie. Just one skillet! If I make ahead and keep in fridge all day, do I just had some extra cook time at the end? Like 15 min? Hey Rebecca! I assume you mean make it ahead of time UNbaked. Yeah, I would add at least 15 minutes, might be up to 30. Keep an eye on it! It’s done when the cheese is melted and the edges are bubbly. Enjoy! Very good will make this again. 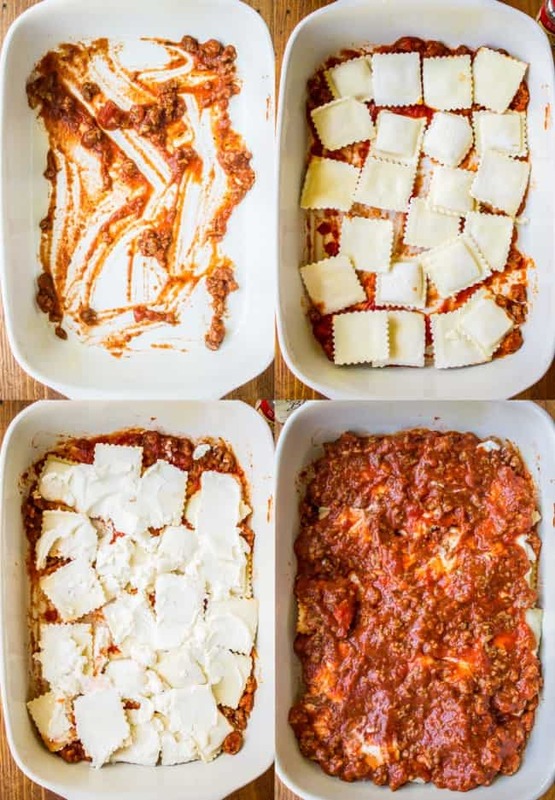 What type of filling do you use in the ravioli please? Hey Jennee! I buy cheese ravioli, but any kind you like would be good! 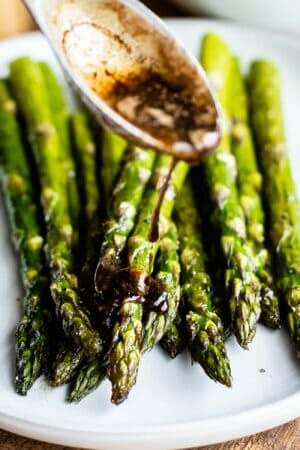 would you make this and cook in oven then refridgerate and take out portions later to heat up? Yes Erin, this makes great leftovers! I got the ravioli that is in the fridge department. Not frozen. It says to boil 7 min. Do I have to boil it first since its going into the casserole? Hey Diana! I would think not. I’m guessing frozen ravioli isn’t boiled before it’s frozen, is it? I’m sure they just make it and freeze it. But. I haven’t tried it, so can’t say for sure. Let me know how it goes! I fixed it last night. Was really good. My whole family loved it. I didn’t boil the ravioli and it turned out great. Made it just like the recipe I just added some pepperoni between the layer and on top. It sure was a hit I will be making again. I made this and we LOVED it. I didn’t have time to make meatballs so I just browned the sausage and made meat sauce. It is a HIT in my house. I’m so glad you loved it Mitzi! I was confused reading your comment because there are no meatballs in this recipe. But then I looked at the post and remembered about the picture of my daughter making meatballs. Haha! Thanks for the comment and review! Did I tell you that I literally READ this post aloud when we had friends over for dinner a few weeks ago? It’s amazing. Char is the coolest meatball kid in class. I recently switched to a later shift at work and my fiancé is in charge of all the cooking (terrifying…I know). I’ve been looking for recipes like this that I can prep ahead and all he has to do is pop in the oven. I love this! So much easier than regular lasagna. Will definitely be making this one. And soon! Great idea Stephanie! this is the perfect make ahead dinner. I hope the later shift works out for you! I would let my husband do all the cooking…but only if I had to. haha. Hahahaa!! Oh my goodness! 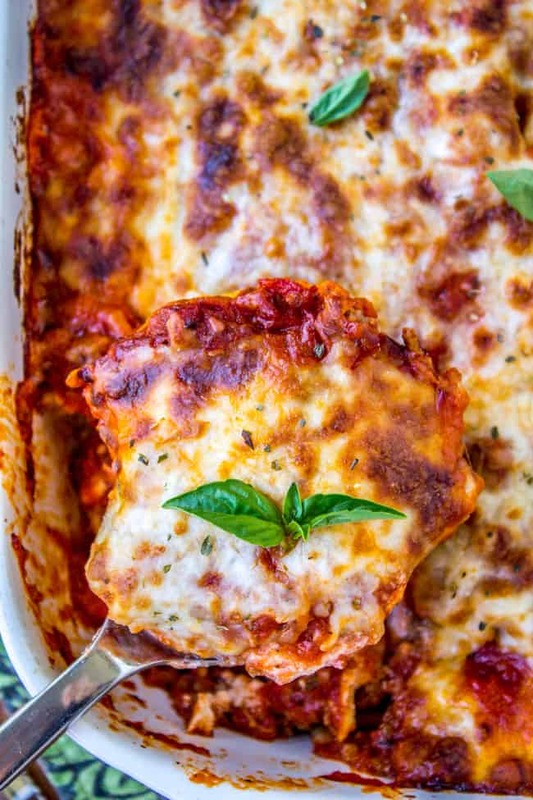 Truly a child of a food blogger :) I have to get my hands on some gluten free ravioli so I can make this! Pretty sure my husband would have done the same thing! 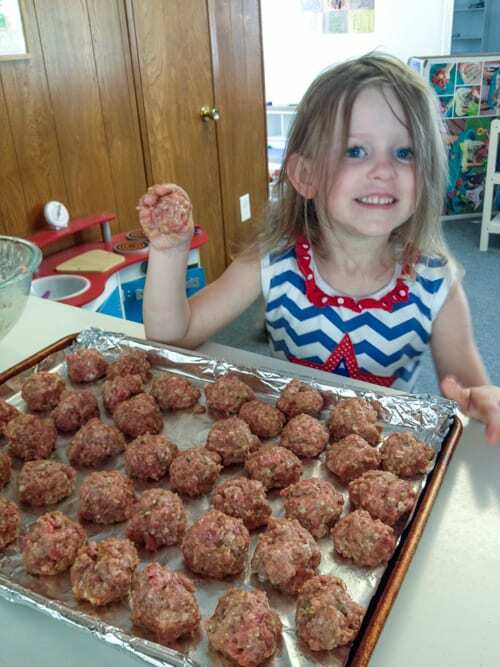 At least your daughter’s adorable even with raw meatballs! ;) Love quick and easy meals like this! hahahah oh my gosh! Yes there are definitely raw meatballs in that picture!!! Oh that made me laugh! My husband would do the same and not even think twice about it! And this looks so cheesy and delicious! 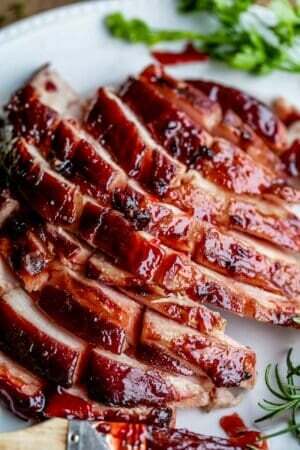 Yum, Yum and Yum :-) pinned for sure. Karen, I absolutely love coming to your site and reading your posts. You really know how to make a gal laugh. That meatball picture is hilarious, but Charlotte looks so dang happy with that tray of meatballs (and, can you blame her?). Love this recipe to pieces. Pinning, everywhere! Ok, the meatball pic is awesome! What preschooler doesn’t want to display that pic for everyone?? The other kids are going to be jealous and will now want to play with raw meat at home too! 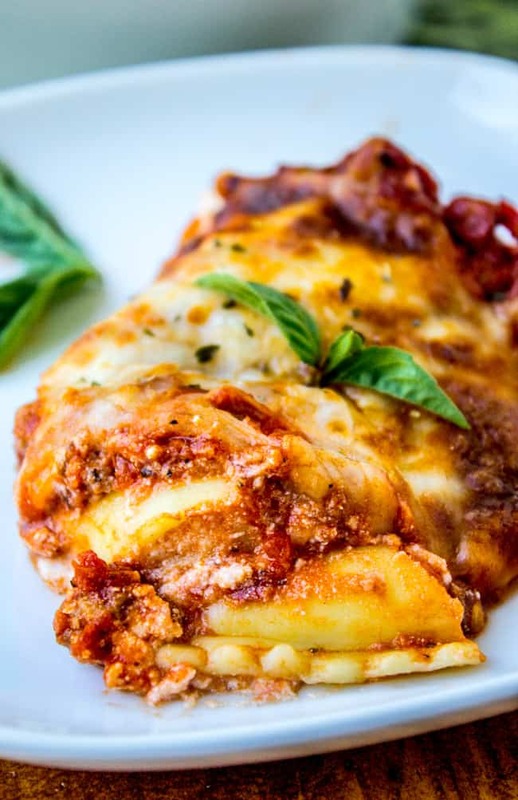 Also, this lasagna looks sooo good! Not to mention my husband always begs me to make lasagna and I always tell him no because it takes too long. Problem solved! This is comfort food at its best! Yum! I have to agree with Eric on this one, that pic is adorable, meatballs and all! The girl knows good food when she sees it…. Wow! What a cheese lover’s dream! When I was a kid I used to beg for ravioli for supper, so making this will be like going down memory lane. Looks delicious! You crack me up! 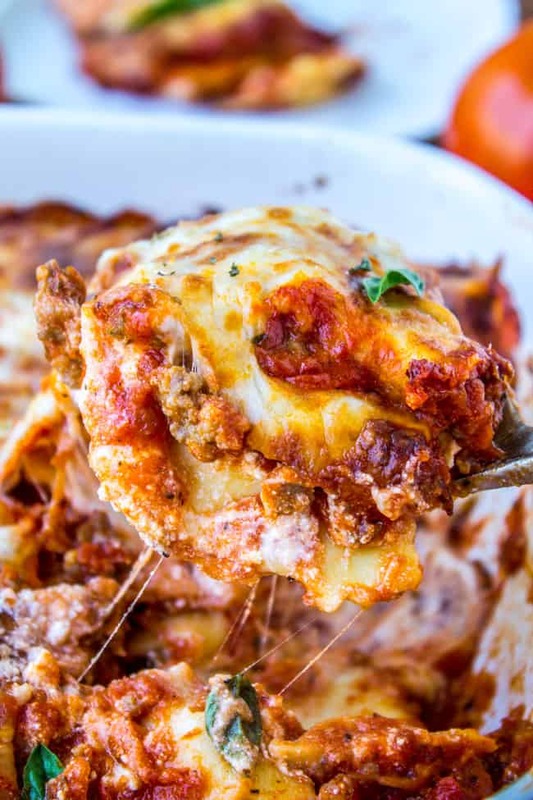 And this lasagna…holy cheese batman. Looks amazing! 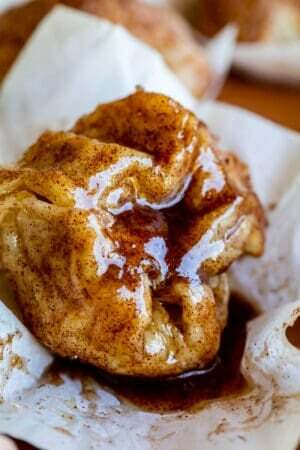 Something this easy and yummy looking can’t be possible! I can’t wait for the cooler weather so I can make #allthecarbs again. Hello beautiful freezer meal. I can’t imagine anything more delicious when I have a newborn…I am so excited. I’m so glad to hear that Loredona! I haven’t had any complaints about printing problems, but I will be sure to check it out! 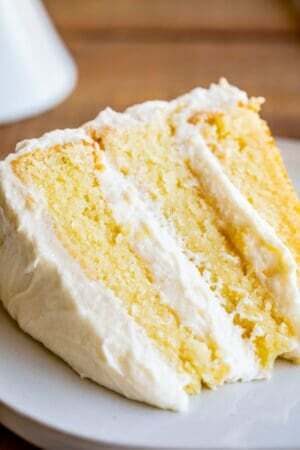 This recipe is perfect for us! I love simple Italian dishes during the week – one of my favorite ways to cook! yum!